Being the expert you are on your activity you’ll certainly have a lot of things to say, it’s only a matter of getting them organized in your head first, then on paper and finally under the form of a post (you’ll be very proud of yourself once you produce your first post). Writing for the web calls for some additional attention: normally we are used to suppressing word we believe are “unnecessary” because “it’s understood” … but if a search engine is listening, things change. Search Engines do not understand our intent – either we say them or we don’t – if we don’t then we probably missed an opportunity to use a keyword someone may use to query the search engines and identify websites just like yours. Thats’ why it’s important not to leave words to imagination. You can easily anticipate just how different each and every one of us use the search engines to find what we define as relevant websites. So how can you identify which words people are using ? There are 2 different paths to follow, depending on where you are in the process of creating your blog. You need to rely on tools such as the Google Keyword Tool or other similar ones. 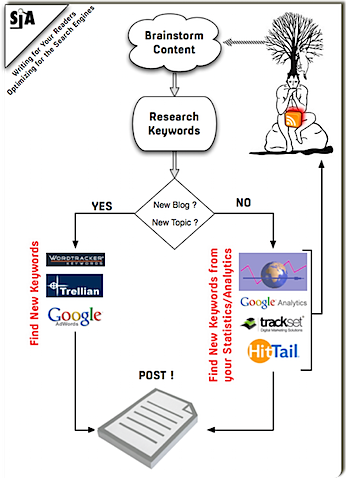 What can you do with a keyword tool analyzer ? You can identify relevant phrases used by people interested in your products and services. You’ll be surprised to see just how articulated and diversely people can search. By doing so you can focus on those keywords that are relevant to your business with less competition, and in turn increase significantly your chances of ranking well on the search engines. This is your first go at things. Write your posts and use the keywords you identified using these tools. Remember to use them every time there is a relevant opportunity to do so. Read your post once you’ve written it – if it doesn’t sound right, don’t publish, make corrections, you’re writing for your readers AND the search engines. Don’t forget to write descriptive and compelling TITLE TAGS and META DESCRIPTIONS (remember I gave you all the information in my post on WordPress Plugins). Finding new keywords is a relentless effort – the more you put into this activity the more traffic (and orders) you get back. It’s that simple. Finding new business opportunities happens every day online: trial and error are your allies in this never ending keyword discovery game. Hi Sante there are some other great tools for finding your keywords, I highly recommend Wordtracker, you do have to pay for it will help a great deal with identifying which keywords have the most searches and least amount of competition. Another great tool is Woopra, which can provide a wealth of information about your site visitors, there is even a pop up box so you can interact with your site visitors live, that is if it doesn’t frighten them off and its free which helps. I’m not sure if putting so much work into writing a single post just so it gets a little higher slot in the search engine results is the best idea. I don’t agree with “youâ€™re writing for your readers AND the search engines”. I think you should write just for your readers and if by some accident the post will also appeal to search engines then you’re lucky. Usually people underestimate the importance of keyword research. They prefer using their intuition which isn’t such a good idea. 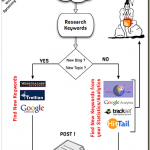 It is necessary to emphasize the importance of keyword research. That’s a very good and helpful guide to selecting your keywords for a post, its also worth noting not to go overboard with keywords and stick to targeting 2-3 keywords/phrases maximum per post, otherwise the search engines become confused as to what your page is about. Good article, WP has some excellent keyword plugins too such as a plugin to suggest yahoo keywords. Keyword research and analysis are the most important basic step in any optimization efferts. This is a great article to highlight the vital fact. Lately, Google had presented thei last technololgy called Google Instant. This technology, to my belief has great impact on the way people think when searching for a query. Today Google makes the thinking for most of the people. Some of the long-tails are already dead.